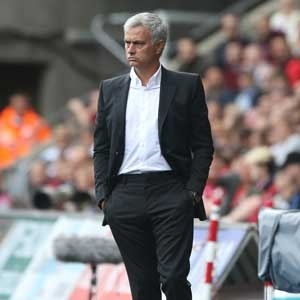 Manchester United manager Jose Mourinho is unhappy following his side’s 1-0 loss at Basel in the UEFA Champions League on Wednesday. A dominating Manchester United side failed to convert several chances in the first half. Michael Lang scored a late goal in the 89th minute to hand the visitors their first Champions League defeat this season. The result also keeps United in the hunt for top spot in the group and a place in the last 16. “Half time it should be 5-0, they didn't have a shot, we hit the post twice, had huge percentage of the ball, we created numerous chances, the game was easy to win, you don't score, the opponent survives and in the second half you feel they have a chance," he said. After the break, Basel came to life and turned things around, piling pressure on United defense to break the deadlock before Lang, beating Daley Blind at the far-right post, struck the hammer blow with one minute left on the clock.